Tucked away in the north eastern corner of Chobe National Park on the Linyanti waterways is Camp Linyanti. Remote, unspoilt, with the lagoons of the Linyanti floodplains before it, and riverine forests with huge trees surrounding it, Camp Linyanti is an undiscovered gem. Camp Linyanti is a 90 minute game drive from Saile airstrip located in the Chobe National park. Fed by the flooded Chobe and Kwando rivers, the vast floodplains of Linyanti stretch out to Namibia’s Caprivi Strip, and create a wetland oasis in an otherwise parched landscape. 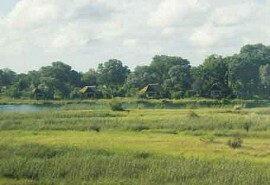 The Linyanti region of the Chobe National Park is a seldom-explored area of this remote wilderness. Camp Linyanti is a 90 minute game drive from Saile airstrip located in the Chobe National park. The vast floodplains of Linyanti stretch out to Namibia’s Caprivi Strip, providing striking views. Opened private routes in this remote part of the Park, allowing access to this region of Chobe National Park for the very first time. The Savuti region covers an area approximately 5000 sq km in the south west of Chobe and became well known with the drying up of the Savuti Channel in the early 1980s. 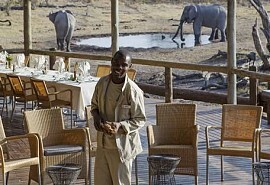 Even more so, it is known as an incredible game viewing paradise. The pans and pumped water holes become the major attractions during the dry winter months when the natural water supplies dry up. The area is considered one of the continent's last wild and unspoiled wilderness areas. During the rainy summer months many animals migrate to the fertile Savute Marsh. The Savute Marsh area is well known for its coverage in a number of well-known wildlife documentaries, especially the National Geographic films by Dereck and Beverly Joubert. The landscape consists of rich grasslands, savannah woodland and a large variety of trees and vegetation. Savute Elephant Camp is located in the game rich Savute area of the Chobe National Park. 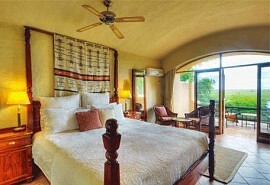 It is a luxurious safari lodge, with all the chalets being air conditioned. As the name suggests, the camps is regularly visited by large elephant herds. 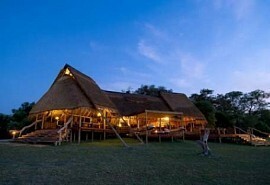 Chobe Game Lodge is one of few safari options located within the borders of the Chobe National Park. 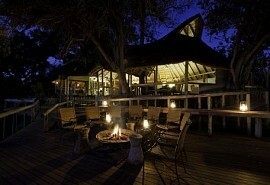 It is a large lodge that is very well located on the banks of the Chobe river. It offers game drives and boating safari activities. Savute Safari Lodge offers an excellent wildlife experience in the Savute Marsh area of Chobe National Park. Most of the chalets overlook the Savuti Channel where guests are often treated to incredible elephant sightings. The Savuti Marsh, fed by the Savuti Channel, has developed a reputation over the years as one of the world’s premier predator viewing areas, boasting one of the highest concentrations of wildlife on the African continent. Savuti Ghoha Camp is perched on the Ghoha Hills, overlooking the vast expanse of the Savuti area of Chobe National Park. 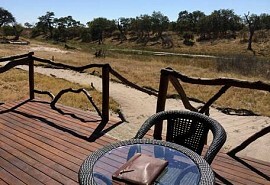 The elevated position of the camp offers breathtaking views, surely some of the very best in Botswana.